When Mindsight was recommended to me, I immediately bought it. It arrived a couple of days later, and promptly sat on my bookshelf—through a move—for months. I just wasn’t ready to read it. 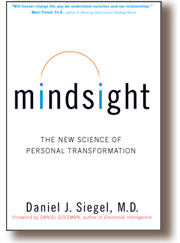 Mindsight is Daniel Siegal’s newest book2. His writing style is both conversational and engaging, even though he often refers to complicated brain chemistries and structures (You’ll never look the same way at your enclosed fist again). His patient histories provide the lively characters for a book whose major plot is a scientific exploration of the “squishier” parts of our most important organ. The question at hand: how can we understand and experience our consciousness as an interested, yet compassionate third party—a concept Siegal dubs “mindsight”—to achieve what he calls integration3 within our minds. Mindsight provides medical research to back up the technique, which interestingly is what I’d describe as a form of guided super-meditation; as an engineer, I appreciate the scientific digressions discussing why meditation has been humanity’s go-to for psychological serenity across both centuries and cultures. My only disappointment was that the book doesn’t get as far into the details of Siegal’s techniques as I would have liked. He does talk at a very high level about what has worked for his patients, but leaves just enough out that trying it yourself can be a bit daunting. It doesn’t help that his patient case studies make it all look so easy4. This proposal is no easy task. Dissolving fixed mental perceptions created along the brain’s firing patterns and reinforced relationally within our cultural practices is no simple accomplishment. Our relationships engrain our early perceptual patterns, deepening the ways we come to see the world and believe our inner narrative. Without an internal education that teaches us to pause and reflect, we may tend to live on automatic and succumb to these cultural and cortical influences that push us toward isolation. Maybe it’s someone whose conflict resolution process involves stabbing her co-workers in the back, figuring they’ll never compare wounds with each other. And she can’t figure out why she’s not the success she thinks she should be. Maybe it’s an acquaintance who proudly boasts about his dating flavor-of-the-week. In between shots at the bar. We all know people similar to these, either out about in the world or within the confines of your own consciousness. Mindsight provides insights into the tools to start figuring out the most important question in addressing them: why. 4 They’re all so happy at the end of the chapter! And always cured!